SAE/AEM Outstanding Young Engineer award winner Amy Jones receives plaque from SAE Board of Directors member Landon Sproull of PACCAR Inc. at 2017 SAE COMVEC Awards Luncheon. Amy Jones, Senior Engineer in the Construction and Forestry Division of John Deere, has earned the SAE International/AEM Outstanding Young Engineer Award. The Association of Equipment Manufacturers (AEM) and SAE International established the award in 1996 to recognize an outstanding young engineer in the off-highway or power plant industry. The award was proposed by senior engineering executives and is administered under the auspices of the SAE Engineering Meetings Board in cooperation with AEM. 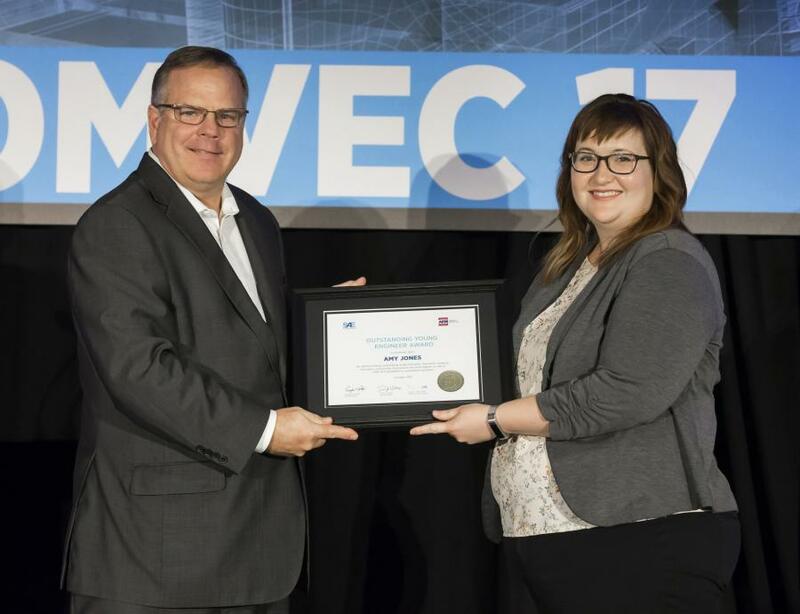 Jones received the award at the SAE 2017 Commercial Vehicle Engineering Congress held earlier this year in Rosemont, Ill.
Jones began her career as a project engineer at Sachs Electric Company in St. Louis, where she was responsible for the successful execution of large scale industrial and commercial construction projects. In 2010, she joined John Deere as a software verification and validation engineer in the Construction and Forestry Division, where she had previously completed three internships as an undergraduate. As a test engineer, she received recognition for leading the first team to successfully implement the complete embedded software development process on a construction product line. Her work led to an unprecedentedly smooth launch of the Excavators Outside the Americas product line, produced in Tianjin, China. In 2014, Jones accepted her current position as senior systems engineer. In this role, she supervises and leads a global team to define, develop and implement electrical systems that meet the needs of a diverse customer base. Jones has a driving passion for STEM (science, technology, engineering, and mathematics) outreach, which began during her undergraduate education. Since then, she has dedicated herself to creating opportunities for thousands of students in eastern Iowa. She is active in the Society of Women Engineers and IEEE. In 2014, Jones was chosen as IEEE-USA's New Face of Engineering. In 2016, her book “Quietly, Clearly, and Authoritatively” was published by IEEE as part of their digital series on Women In Engineering. Jones earned an MS in electrical engineering from Purdue University. She also graduated with highest honors with a BS in electrical engineering and minors in business, mathematics, and psychology of leadership from Missouri University of Science and Technology. She is currently pursuing a System Design and Management Certificate from MIT.